, marquis of Segnelai, one of the greatest statesmen that France ever had, was born at Paris in 1619, and descended from a family that lived at Rheirns in Champaigne, originally from Scotland (the Cuthberts), but at that time no way considerable for its splendour. 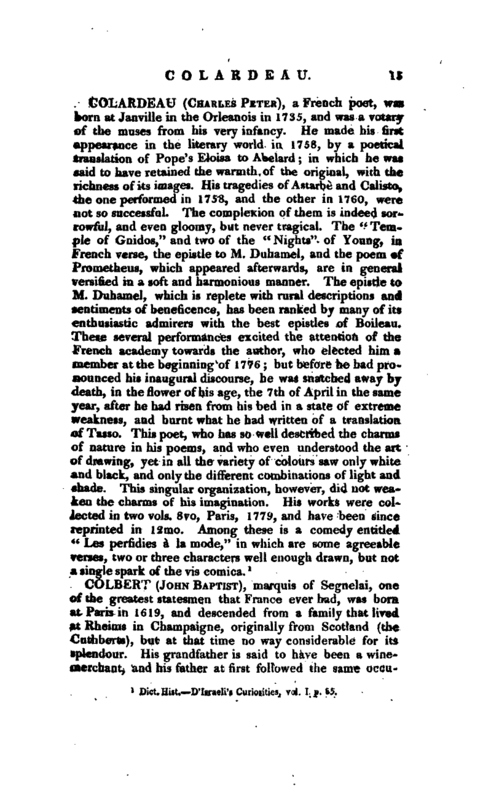 His grandfather is said to have been a winejuerchant, and his father at first followed the same | occupation but afterwards traded in cloth, and at last in silk. Our Colbert was instructed in the arts of merchandize, and afterwards became clerk to a notary. In 1648 his relation John Baptist Colbert, lord of S. Pouange, preferred him to the service of Michael le Tellier, secretary of state, whose sister he had married; and here he discovered such diligence and exactness in executing all the commissions that were entrusted to his care, that he quickly grew distinguished. One day his master sent him to cardinal Mazarine, who was then at Sedan, with a letter written by the queen mother; and ordered him to bring it back after that minister had seen it. Colbert carried the letter, and would not return without it, though the cardinal treated him roughly, used several arts to deceive him, and obliged him to wait for it several days. 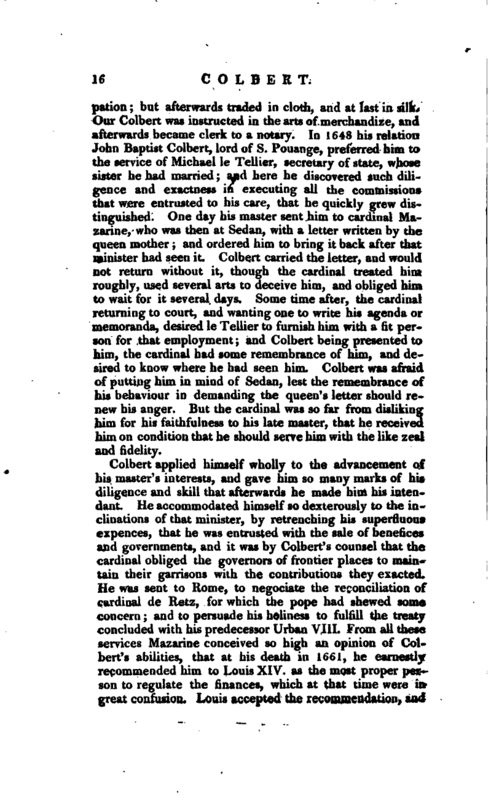 Some time after, the cardinal returning to court, and wanting one to write his agencte or memoranda, desired le Tellier to furnish him with a fit person for that employment; and Colbert being presented to him, the cardinal had some remembrance of him, and desired to know where he had seen him. Colbert was afraid of putting him in mind of Sedan, lest the remembrance of his behaviour in demanding the queen’s letter should renew his anger. But the cardinal was so far from disliking him for his faithfulness to his late master, that he received him on condition that he should serve him with the like zeal and fidelity. 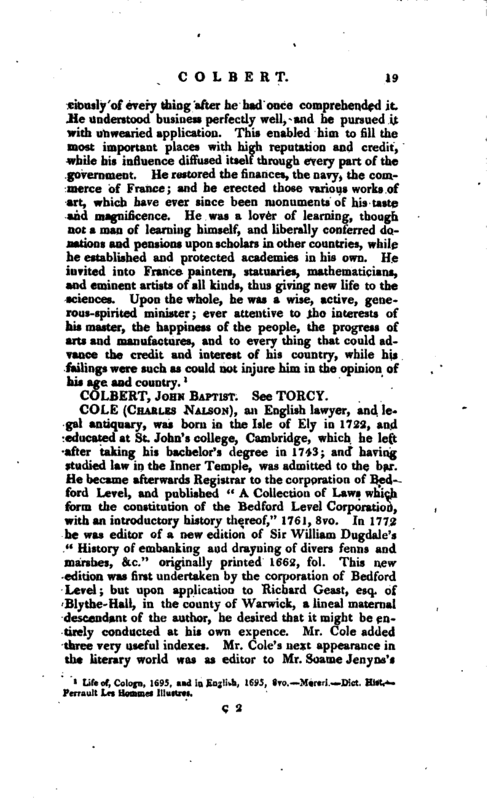 Colbert applied himself wholly to the advancement of his master’s interests, and gave him so many marks of his diligence and skill that afterwards he made him his intendant. 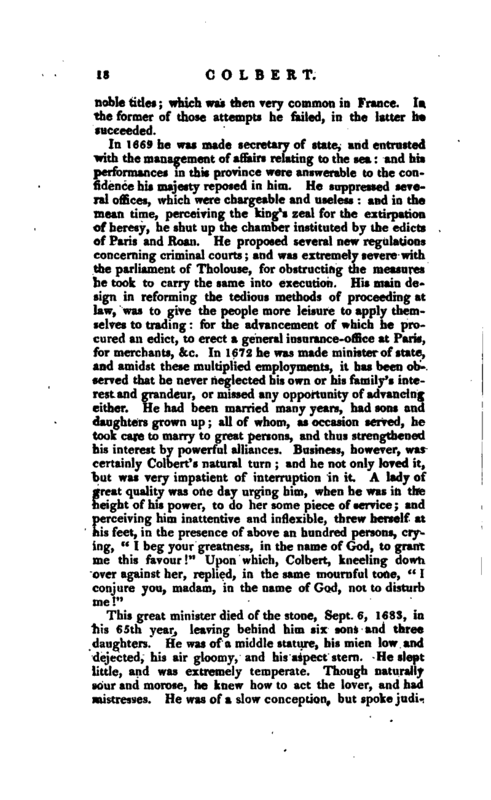 He accommodated himself so dexterously to the inclinations of that minister, by retrenching his superfluous expences, that he was entrusted with the sale of benefices and governments, and it was by Colbert’s counsel that the cardinal obliged the governors of frontier places to maintain their garrisons with the contributions they exacted. He was sent to Rome, to negociate the reconciliation of cardinal de Retz, for which the pope had shewed some concern; and to persuade his holiness to fulfill the treaty concluded with his predecessor Urban VIII. From all these services Mazarine conceived so high an opinion of Colbert’s abilities, that at his death in 1661, he earnestly recommended him to Louis XIV. as the most proper person to regulate the finances, which at that time were in great confusion. Louis accepted the recommendation, and | Colbert being appointed intendant of the finances, applied himself to their regulation, and succeeded: though it procured him many enemies. France is also obliged to this minister for establishing at that time her trade with the East and West Indies, from which she once reaped innumerable advantages. In 1664 he became superintendant of the buildings; and from that time applied himself earnestly to the enlarging and adorning of the royal edifices, particularly those splendid works, the palace of the Tuilleries, the Louvre, St. Germain, Fontainbleau, and Chombord. Versailles, which he found a dog-kenuel, where Louis XIII. kept his hunting equipage, he rendered a palace fit for the greatest monarch. 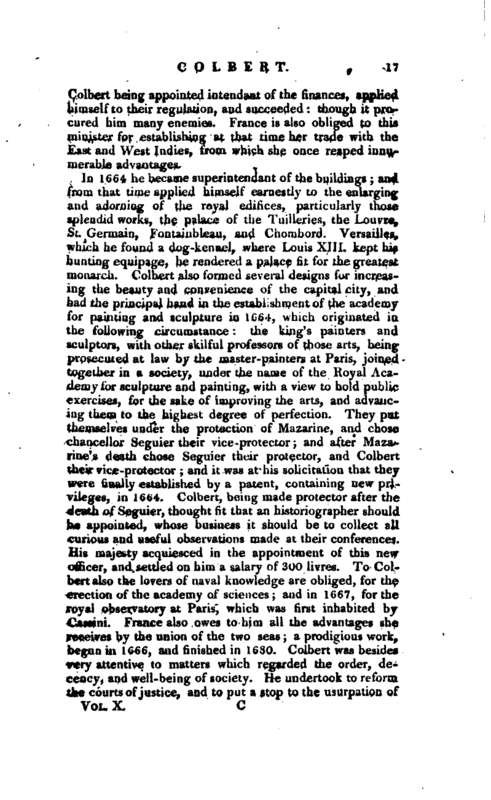 Colbert also formed several designs for increasing the beauty and convenience of the capital city, and had the principal hand in the establishment of the academy for painting and sculpture in 1664, which originated in the following circumstance: the king’s painters and sculptors, with other skilful professors of those arts, being prosecuted at law by the master-painters at Paris, joined together in a society, under the name of the Royal Academy for sculpture and painting, with a view to hold public exercises, for the sake of improving the arts, and advancing them to the highest degree of perfection. They put themselves under the protection of Mazarine, and chose chancellor Seguier their vice-protector; and after Mazarine’s death chose Seguier their protector, and Colbert their vice-protector; and it was at his solicitation that they were finally established by a patent, containing new privileges, in 1664. Colbert, being made protector after the death of Seguier, thought fit that an historiographer should be appointed, whose business it should be to collect all curious and useful observations made at their conferences. His majesty acquiesced in the appointment of this new officer, and settled on him a salary of 300 livres. To Colbert also the lovers of naval knowledge are obliged, for the erection of the academy of sciences; and in 1667, for the royal observatory at Paris, which was first inhabited by Cassini. France also owes to him all the advantages she receives by the union of the two seas; a prodigious work, begun in 1666, and finished in 1680. Colbert was besides very attentive to matters which regarded the order, decency, and well-being of society. He undertook to reform the courts of justice, and to put a stop to the usurpation of | noble titles; which was then very common in France. In the former of those attempts he failed, in the latter he succeeded. Life of, Oologn, 1695, and in English, 1695, 8vo.—Moreri.—Dict. Hist.— Perrault Les Hommes Illustres.